Bright and airy ocean view home. Quiet no drive area of Bethune Beach, just south of New Smyrna Beach just steps from ocean and bay. Short walk to great seafood and cold drinks. Shorter walk to great fishing and a family of Manatees you can swim with, as wall as Dolphins feeding in the lagoon. Canaveral National Seashore and boat ramp just down the road. 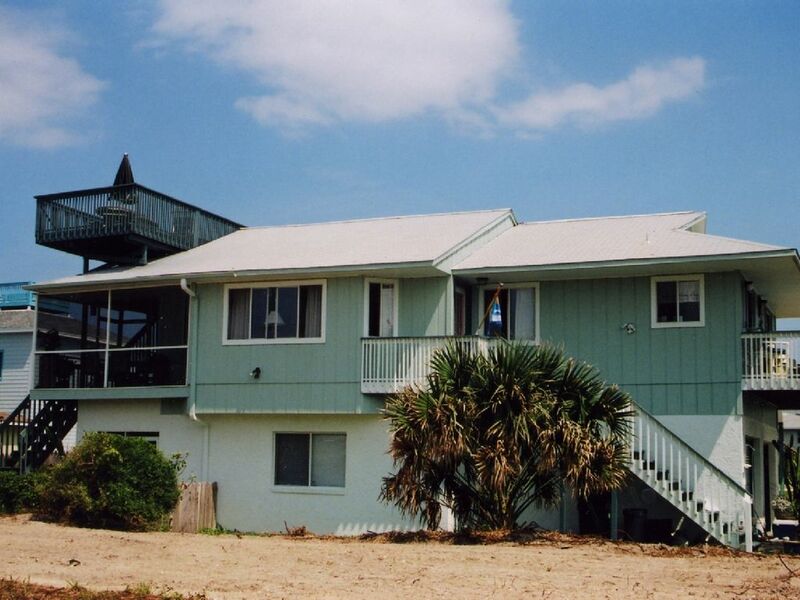 Amenities: Ocean view roof top deck with umbrella and picnic table over looking the ocean. Screened in dining area and porch. Downstairs kids bunk room, sleeps four, has foosball, Ping Pong, TV, VCR and games. House includes a river Canoe, Ocean Kayak, Bikes, Beach chairs and sand toys. Pets considered. Things to do near by: Walk to Manatees and Dolphin in the lagoon, bay fishing, bait shop, and JB's Fish Camp for oysters, crabs, cold beer and glorious sunsets. Two miles to Canaveral National Seashore and the best fishing in Florida. Search for sea shells on the beach or walk it at night and you may see a mother sea turtle laying her eggs or a nest hatching. Put the Kayak and Canoe in Mosquito lagoon and explore Florida as Columbus saw it. The house includes an Ocean Kayak and a River Canoe as well as everything else you would need, just bring your personal items, your favorite foods and beverages, and get ready to relax and have a great time. Our time spent here was nothing short of amazing! Our large family fit very well and it had everything we could have needed and then some. We were all sad to go and can't wait for next time! Peace and quiet, close to the beach. Kayak with the manatees and dolphins. Used the bikes ( put a new tube in one of them). The quiet one way street that is ocean front is good for walk/run/bike ride. Short drive to food and shops. Save your money and stay 1 row off the beach. Will book again. 86 steps from the Beach - what’s not to like! We have stayed at Brian and Kathy’s Beach House 3 times and are already looking forward to returning. It feels as comfortable as home. There were some hiccups on check in day, but Brian quickly made everything right and was very gracious in fixing the mistake (which wasn't even his fought!). The descriptions offered on vrbo of this home and its location are spot-on. Our only disappointment was that the described downstairs floor with bunk beds does not have an inside entry (you have to go outside, down the stairs and enter from the outside) which made it difficult. We had planned on our son having "his own room" downstairs -- but the bedding and pull out couch upstairs allowed us each (mom & dad, grandaddy, our daughter and our son) to still have our own spaces for sleeping. Amazing view from the rooftop deck; we loved eating gelato together under the stars and listening to the ocean at night. Gorgeous, not crowded beach just a few steps away. Gracious property owners who have furnished the home with everything you need. Love this gem on the beach!! Great place to stay on the beach with family for the holidays!! Very clean and the owners were super accomodating!! Would definatley return! Oh and Jb's fish house is a must! Very delicious! Thank you Amy for the kind words, we try and put a little Wow! and a lot of Welcome, in every guests stay. Thanks, and we hope to see you again. This charming home is located just steps from the ocean and its quiet beaches as well as walking distance to the Indian river and Mesquito lagoon, with some of the best fishing in Fla. Put the Ocean Kayak or the Canoe (Included with the house) in the lagoon for a day of fishing, birding, and dolphin/Manatee watching. Take a walk on our secluded beach and look for sea turtle nests, you may even see the hatch lings or the mother Turtle laying her eggs at night. Want a little more action, just an hour from Disney world and Universal Studios and Harry Potter. Spend the day in Canaveral National Seashore and tour the El Dora House, serca Mid 1800s, and explore the lagoon as Columbus saw it . Kennedy Space center 45 min away.. Golf: Fifteen minutes to New Smyrna Municipal Golf course. Very reasonable rates and pretty good play. Many other courses near by.